Excluded from our no quibble returns policy for hygiene reasons. The headset is ideal for Msn messanger, Yahoo messanger, Skype, VOIP and other internet telephoney. The headset uses the 3.5mm mini jack sockets on your pc and has volume control. The headset cable is approximately 2m long. The headset comes in full retail packaging. 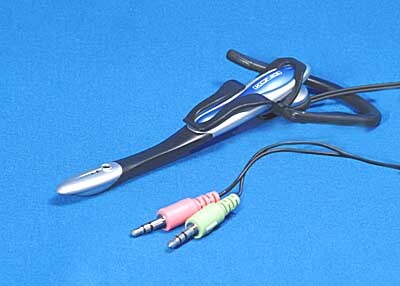 Mono in ear headset with boom microphone. Setting up Skype is easy, take advantage of free voice calls! The headset connect's to your device using 2 x 3.5mm plugs, one for the sound and one for the microphone. It can be used for internet phone calls with Skype, msn messenger and online gaming.